I almost dropped my tray at Clifton’s Cafeteria when I learned that the esteemed chef Jason Fullilove left Clifton’s last Monday! 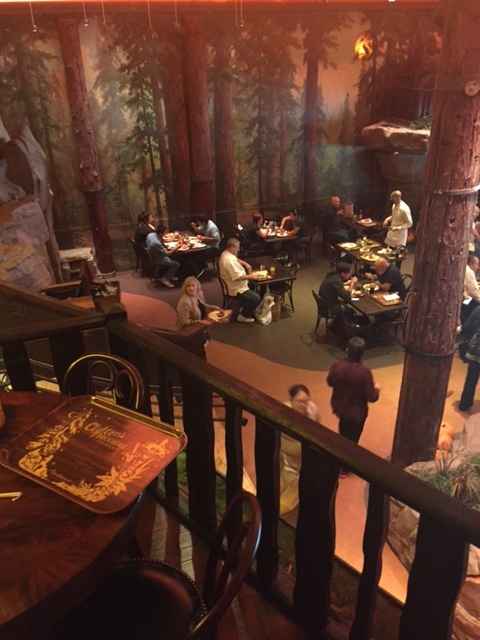 After a three-year renovation, the new Clifton’s Cafeteria opened with a media blitz a little over one month ago. NPR had a great piece about the beloved spot that originally opened in 1932. When I heard that they acquired Executive Chef was Jason Fullilove, it piqued my interest even more. Fullilove graduated from the prestigious Culinary Institute of America in New York, worked with Mark Peel at Campanile and The Tar Pit Restaurant on La Brea. Later, he joined the Patina Group and had a stint at LACMA cooking for special events, large parties, the Pop-up restaurant RED and a creative tasting menu inspired by the Stanley Kubrick film exhibit. Before Clifton’s, Fullilove was the darling of Malibu preparing innovative dishes at The Malibu Pier. What a great idea! Foodies in LA know about Fullilove, so it will bring a younger generation into the cafeteria. I heard he had to keep many of the beloved food items to attract the locals and regulars who have been dining here for years, yet could add a little magic touch. 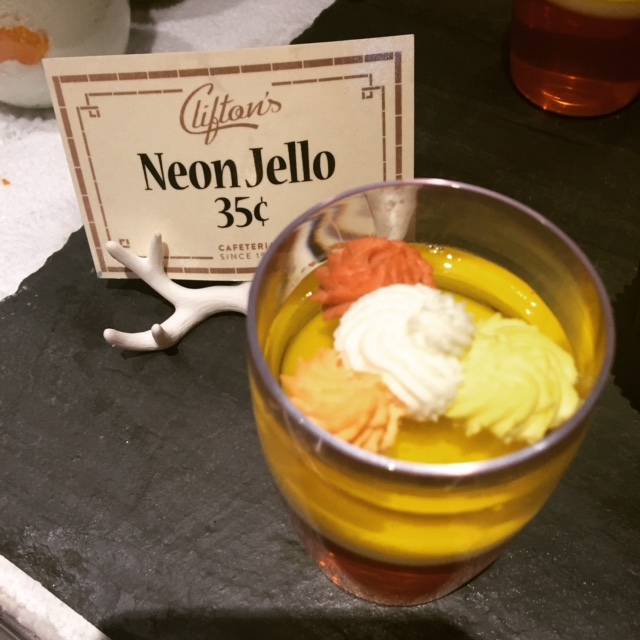 The last time my father, born in 1932, visited Clifton’s Cafeteria was 50 years ago. Recently, after attending a Hollywood High School reunion, he was invited to join a group of 80+ year-old men to their once-a-month lunch club. Each month they organize a lunch at one of their old Hollywood or Los Angeles haunts. Clifton’s was scheduled for the November lunch. Since he isn’t as confident in his driving, as he used to be, I asked him if he would like to do a test-drive with me. I’d sit in the passenger seat and help navigate the 2 Freeway to the 5, then to the 110, and to exit at 6th, and find Broadway. Then we searched the most convenient parking. I told him that I’ve heard that lines of people went around the block to get into Clifton’s, so I suggested we arrive after the lunch crowd. Parking is tough downtown during the day. The closest lot was on 6th, just after Broadway for $9.50. We left the keys with the valet, walked up a flight of stairs into an exquisite marble lobby, inside a historic office building. Then we walked outside onto Broadway and down the block to get to Clifton’s. Where were the lines? A sweet hostess guided us to the cafeteria and handed us trays to get started. The first item I spotted was a row of Candy Corn colored jello for 35 cents. Wow, now that is a deal! However, that is the only deal. A bowl of pumpkin or chicken soup is $6. Sandwiches are just under $10. There are multiple stations to wait for roasted meats, hot items, soup and salad, sandwiches and desserts. The people behind the counter looked tired. It looked like the honeymoon period was over for them. Why? It’s only been less than two months? Gazing over each station I hoped I could spot Chef Jason. When I asked if Chef Jason was here today? One counter person said, “No, he no longer works here.” WHAT???? When I asked what happened and where did he go? With downcast eyes, I was told no one knows. Another disappointment was trying to get my Dad a glass of water. It didn’t exist! The only ice and water found in the cafeteria is from two fancy Coca-Cola machines. Both were broken. Plastic tubs of ice sat nearby the machines with a huge metal scooper that was too big to scoop and place in a plastic or take-out Coca-Cola glass. It was a mess and people were frustrated. Management tried to help customers scoop ice into their glass, and seemed irked too. Once we paid for the items on our tray, we searched for a table on the first floor. Upstairs on the second floor had an even more interesting dining room, but without an elevator for the public, we had to walk up a flight of stairs with our trays in hand. Since my Dad needed to hold onto the hand rails, I carried his tray to a really cool area near a massive tree and a glass diorama with a burly buffalo. 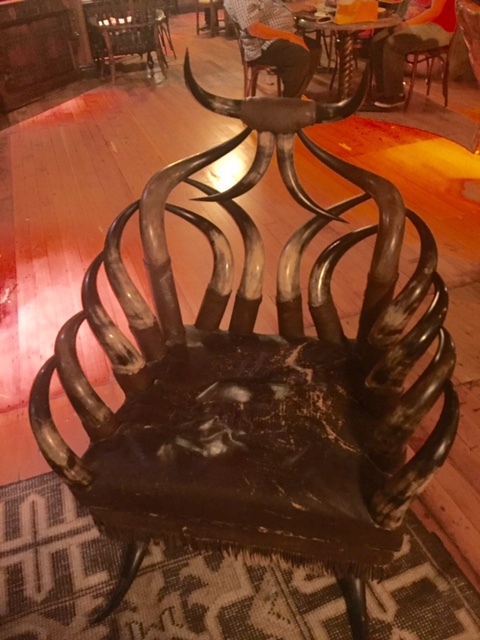 We sat on Bovine horn and deer antler chairs. 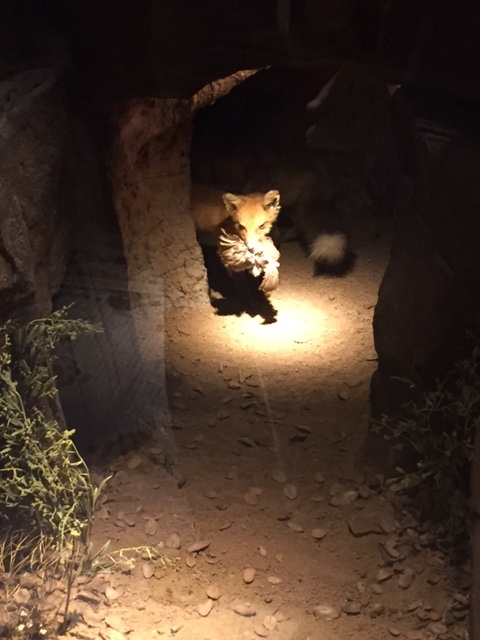 It’s Disney-like with the National History Museum stuffed fox, bear, deer and raccoons nearby. Guests enjoy standing in the trunk of the floor to ceiling tree in the center of the room and surprisingly find a fireplace inside. The long bar with wood stools attracts a crowd seeking an adult Cocktails of California ranging from $12 to $14. Beers on Draft are $6 and $ 7 and wine by the glass range from $10 to $17. After eating our lunch (I will say the tuna salad did have a zip to it), we toured the multi-level cafeteria to learn why the “soul” is gone already. Sadly, trays of food weren’t being cleared up quick enough. I talked to some of the staff about Chef Jason’s departure. The responses I received were interesting – The staff could never keep up in the beginning. Instead of a soft opening, they were slammed with two big events. The next day they had to serve 3,000 to 4,000 people. Another employee told me, that some employees worked grave yard shifts to keep up with the demand of prepping, preparing and delivering the food from 10 am. to 10 p.m.
Next, I learned that some of the kitchen help stayed 24/7 and slept on a couch on the upper floors for a few hours, before getting back into the kitchen. When I asked if they still have long lines? I was told that the quality of the food slipped, because there was never enough time to prepare the food as they would have liked. I hope management is dealing with these issues, otherwise they will be losing more of their core employees. We all know it costs money to hire, train and keep employees. It seems Clifton’s Cafeteria hired a great group of talented individuals, yet kept them on a treadmill cranked up so high, that a few are exhausted and ready to jump off. An incurable defect in this multi-story building is there is only one Men’s and Women’s bathroom and it’s down in the basement. Guests have to walk down a flight of steep stairs from the first street-level floor. That’s two floors from the lively bar and whimsical dining room. For older and handicapped people, there are too many stairs at Clifton’s Cafeteria. 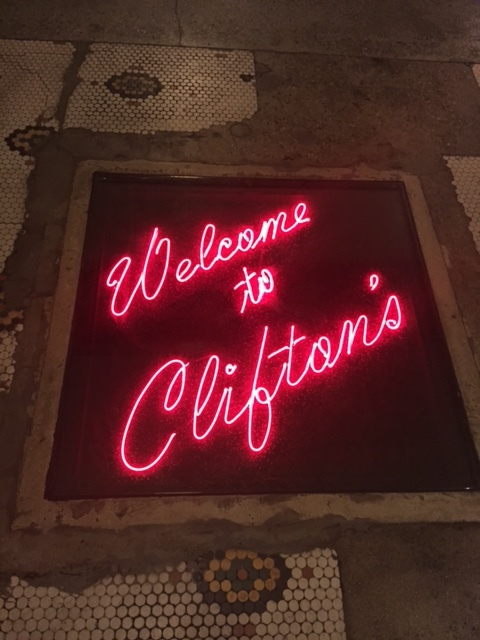 ( After publication – a bartender from Clifton’s informed me – “I’m sorry your expectations at Cliftons were not met, but I can assure you that over the next few months we wil have lots more amenities, menu choices, and bars. Factually, you’re incorrect about the bathrooms. Two are open now and there will be four more all together when the rest of the bars are open. Thank you!”) Another bathroom is in the beautiful Peacock Lounge, however that was closed the day I dined at Clifton’s. Without Chef Jason Fullilove at the helm of the kitchen, I’m not sure how this restaurant will fare. Don’t go for the food, it’s good, however through the years with all the restaurants opening downtown, it’s not epicurean. Families will enjoy the cafeteria experience with their young children. 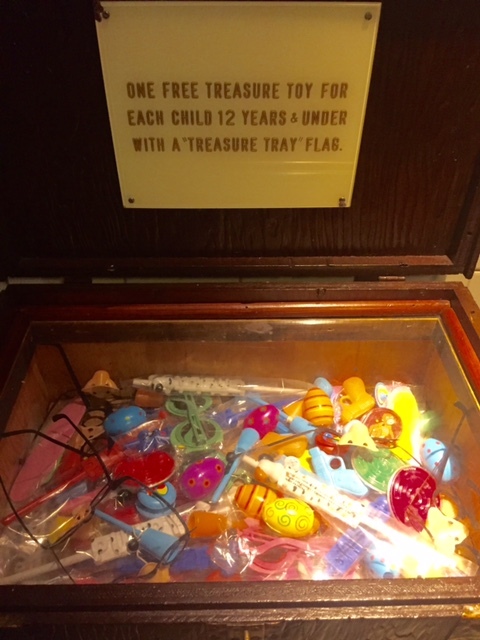 Youngsters under 12 get to pick a prize from a treasure chest. Go explore the artifacts and history of an establishment in Los Angeles that hopefully will solve its problems and rise up in popularity again. 648 S Broadway, Los Angeles, CA 90014 (213)627-1673.
hi there, Clifton’s cafeteria bartender here. I’m sorry your expectations at Cliftons were not met but I can assure you that over the next few months we wil have lots more amenities, menu choices, and bars. Factually, you’re incorrect about the bathrooms. Two are open now and there will be four more all together when the rest of the bars are open. Thank you! GOOD TO HEAR “C” – What other floor has bathrooms? I thought the Peacock Lounge was beautiful, however it was closed when we were at Clifton’s.